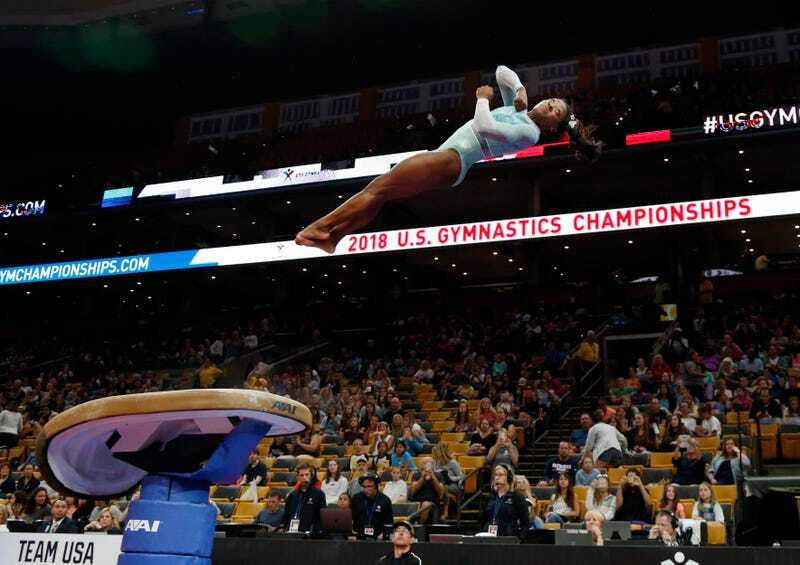 Biles started the night nearly three points ahead of defending world champion Morgan Hurd. By the time she had performed four more times, the margin had grown to more than six points. The margin between Biles and fifth place finisher Shilese Jones was 10 points. You get the idea. After the meet, a very relaxed but hungry Biles addressed the press, which had, for the last time in Boston, crowded around her as she sat on the edge of the podium in her warm up gear. Biles commented on the color of her leotard that night, a mint-teal hybrid, which suggested a statement about survivors of sexual abuse. Activists and survivors have chosen teal as the color of the movement against sexual abuse and assault, and teal ribbons and bows have been ubiquitous at meets during the NCAA gymnastics season. While noting that she had picked out the color of tonight’s leotard back in January, Biles said, “But it is for the survivors, and I stand with all of them.” Biles’s statement via her leotard color choice was the only one on the competition floor acknowledgement of the abuse scandal and survivors. The fact that it was due to the individual initiative of an athlete and not from USA Gymnastics tells you all you need to know about the so-called leadership of the national governing body. During the press meeting with Kerry Perry, the new USA Gymnastics boss suggested that she’s had a lot of interaction with Biles and her family. When this was mentioned to Biles, this seemed like it was news to her.